Frankly, I never been a huge fan of Swiss rockers Shakra, but I keep my eye on them anyway. 2007's 'Infected' was probably the best thing they put out to date, yet it still didn't impress me as it did so many other reviewers. Mostly, they can't seem to step out of the shadow of their fellow countrymen Gotthard. 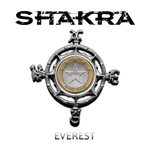 However, with their latest 'Everest,' Shakra's finally got my attention. Though hardly perfect, this work is strong, consistent and entertaining. When I say that 'Everest' is consistent, I mean that every song is well developed and solid melodic hard rock. Three important characteristics give the songs their strength: Mark Fox's steady, unstrained, but raspy delivery, an aggressive and sturdy rhythm section, and above all, some truly inspired and fiery guitar solos. Concerning those solos, with exception of 'Love & Pain,' they're all great. Finally, mention should probably be made of the two and a half ballads on this disc. I say 'half' because 'Anybody Out There' passes as a bit heavier, and overall is better than 'Why' and 'Hopeless.' Of these, the former is basic and less memorable; the latter is more emotional and passionate. With 'Everest,' I believe Shakra has finally pulled me out my ambivalence towards them. 'Everest' is a strong and satisfying work melodic hard rock from beginning to end. Very recommended! With 'Everest,' I believe Shakra has finally pulled me out my ambivalence towards them. 'Everest' is a strong and satisfying work melodic hard rock from beginning to end.